Link: The badge is based upon the Arms of Otranto where the Squadron was formed. History: Formed 1 April 1918 at Alimini, Italy. 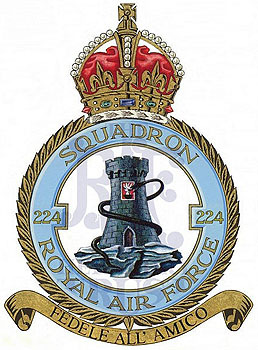 Disbanded 31 October 1966 at Gibraltar. Battle Honours: 1. Italian Front & Adriatic 1918. 2. Channel & North Sea 1939-45. 3. Norway 1940 4. German Ports 1940. 5. Atlantic 1941-44. 6. Biscay 1942-44. 7. Normandy 1944. 8. Baltic 1945.